There are some analysers on the market that do not display reactance X or even magnitude of reactance |X| and possibly resistance, but do display VSWR and magnitude of impedance |Z|. As for the sign of reactance, it cannot be calculated from |Z|, you need the phase angle and most of this type of instrument does not actually sense the sign of phase. Let’s work an example. Lets say you measure the mobile antenna discussed in the last article in this series, and you measured VSWR=4.61 and |Z|=209Ω, we can calculate R and |Z| using the calculator above. 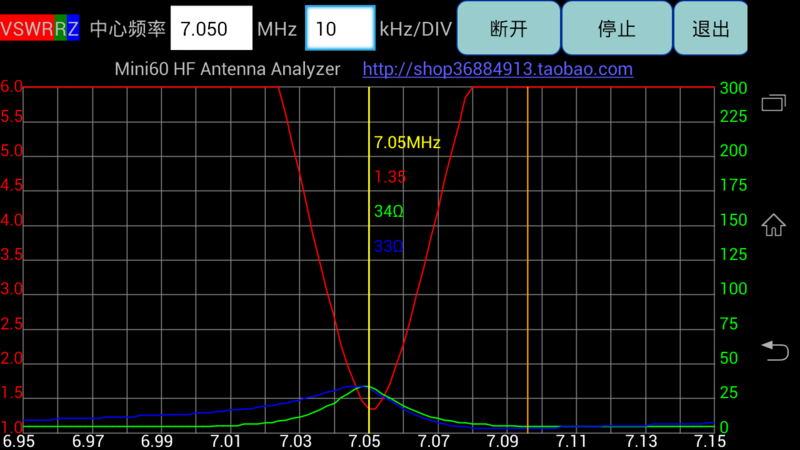 The results tell us that R is 191Ω, |X| is 84.1Ω, and the magnitude of phase angle of Z |θ| is 23.7°, we are fairly close to a voltage maximum. 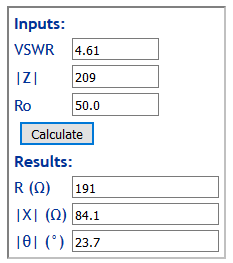 It is possible to calculate R and |X| from VSWR and |Z|, but tedious. Check the consistency of instrument results before you put faith in them.